Summary: How much does it cost to build a house in Connecticut with an unfinished basement? How to add a basement emergency door. Architect David Moore, President of Original Home Plans, LLC has a wonderful collection of traditional home plans on Original Home Plans. David is a graduate of Williams College and Harvard’s Graduate School of Design. In addition to being a licensed architect, David has experienced home construction from many points of view, as a carpenter, a general contractor, a speculative builder, and a homeowner. He knows first hand the ins and outs of construction, as well as design. 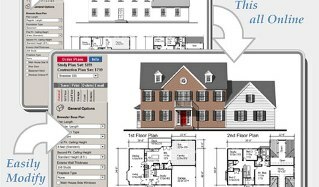 You can order a stock house plan from Original Home Plans or configure one to meet your personal specifications with the Original Home Plan Tool. The Plan Tool offers many options, such as an extended master suite or sitting room above the garage. This house can expand to from 2 to 3½ baths and from 3 to 4 bedrooms. Other interior options include a choice of kitchen layouts, several master bath upgrades, and alternate laundry locations. The first and second floor ceilings can be raised to 9 feet and the main house can be lengthened by up to 4 feet. You may choose a 2 or 3 car garage and place the doors on the front or side of your home. On the exterior, change the siding to clapboard, stucco, shingles, or brick. Choose from many optional features including porches, roof styles, and gables to create your own original design. Check it out. 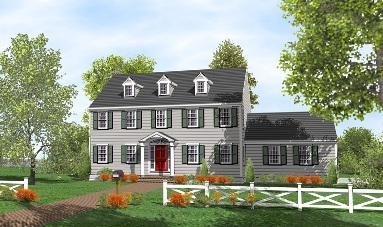 But for my project today, estimating the cost to build in Connecticut, here is a four bedroom traditional home called The Salisbury 323 from Original Home Plans, LLC. That’s an approximate cost of $131.40 per sq. ft., including a general contractor markup of $35.195. Again, the estimate for this house is an approximate one based on “Average Standard” quality materials and an unfinished basement foundation. Until you actually start getting bids and entering them into your own spreadsheet (see my spreadsheet page for FREE spreadsheets), they will remain approximate. One way to get economical additional living area is to finish the basement. That’s approximately 1,321 more sq. ft. However, if the basement is on flat land, you will probably need an Emergency Basement Door because all “living areas” must have 2 means of ingress and egress. The cost of this Emergency Basement Door is not included in my cost to build example above.